Seeing this Iowa Historical Society photo in an Iowa newspaper that published a Clare McCarthy IowaWatch story prompted Jeanne Buck Coburn to contact McCarthy. 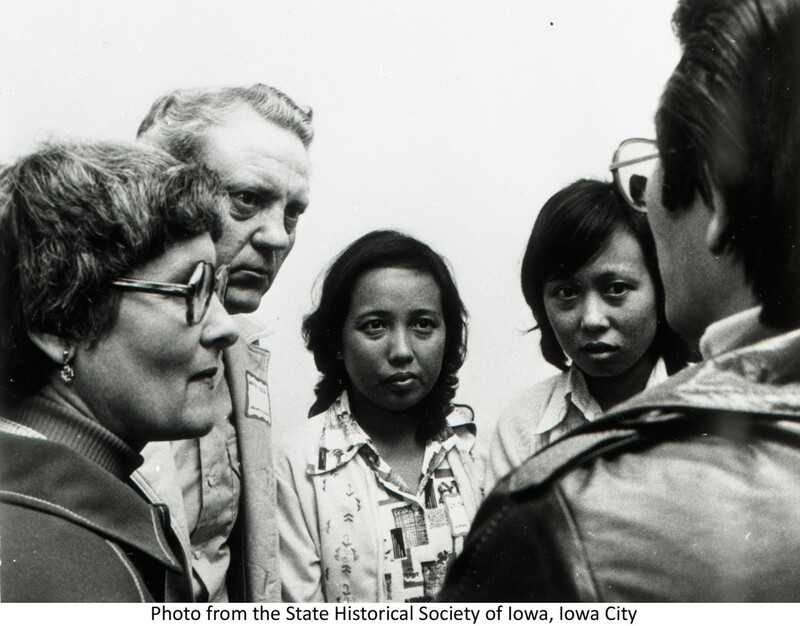 The picture shows Vietnamese refugees gathered in Des Moines in the 1970s with Coburn's parents, Eleanor and Wayne Buck of rural Melbourne, Iowa, who helped the refugees resettle in the state. The milk carton was sitting on the floor again. Jeanne’s mom had stocked the farmhouse kitchen with basic food necessities, hoping to ease the stress and pain of moving into an entirely new place and home. She had even gone to the Oriental food store in Des Moines, a place where they ended up buying most of their food. When the family arrived, they took the milk from the fridge and set it on the floor. She had told them just yesterday that milk was a perishable item—it needed to stay in the fridge or it would spoil easily, it would no longer be drinkable. They nodded their heads, looks of gratitude and appreciation crossing their faces, and the way they conversed seemed to convey a sense of understanding. But when Jeanne and her mother came to visit the next day, there it was again, sitting on the kitchen floor next to the unpacked boxes they had brought with them. “Mom, the milk is on the floor again,” Jeanne said, skeptical and confused. Milk seemed like such an everyday commodity to her, a perfect go-to drink for dinner and dessert, a delicious treat for every kid her age. Her mother explained later that people in Asia didn’t drink cow’s milk very often. The 1975 fall of Saigon at the end of the Vietnam War led to the evacuation of all American military and civilians from the city, plus approximately 125,000 Vietnamese refugees who resettled in the United States. Several years later, a second wave of refugees termed “the boat people” headed for the United States, making their tedious way across the sea in rickety boats packed with up to 200 people from the former South Vietnam and other southeast Asian countries. Many perished at sea due to starvation, pirate attacks, or drowning, but more than 100,000 refugees made it to the United States in 1979. Iowa was the first state to offer resettlement assistance to refugees in 1975 and continued to do so in 1979. In July 1975, former Gov. Robert Ray responded to a personal request from President Gerald Ford to offer resettlement to refugees from southeast Asia. He established the Governor’s Task Force for Indochinese Resettlement, which was expanded later to serve all refugees in Iowa and renamed the Iowa Refugee Service Center. Her parents were in the photograph on the front page of my article, just as they were meeting the family they were about to sponsor in April of 1979. Their names were not mentioned in the caption, nor was any information given about the family apart from Governor Ray welcoming them to Iowa. I was given permission by the State Historical Society of Iowa to use the photograph, which was one of several chosen to emulate the large number of Vietnamese refugees who immigrated to the United States in the late 1970s. However, I never gave much thought to the photos—they were simply an addition to my story, something that might make it more appealing to readers and draw more attention. After all, my focus was aimed towards the response to refugees in Iowa today; I simply compared that to the response forty years ago. Several months passed before I heard from her. 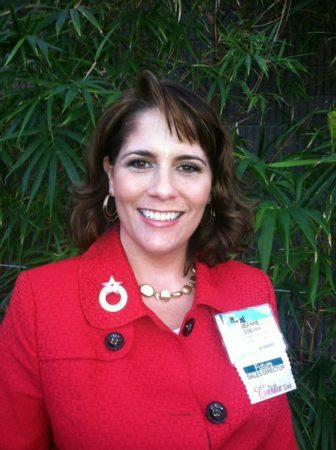 Jeanne Buck Coburn, a sales director for Mary Kay Cosmetics living in Waterloo, Iowa. She contacted me through LinkedIn, a site I check only occasionally since it typically involves notifications about friends of mine getting new jobs while I continuously search for one of my own. The message was a pleasant surprise, detailing Jeanne’s enthusiasm for my article. She was interested in telling me her own story, since the photograph on the front page was directly tied to her life and her experience with the refugee crisis of the 1970s. 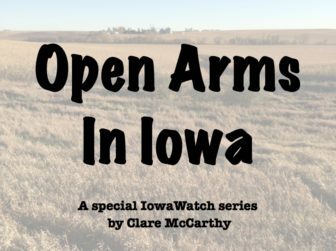 Jeanne wondered if I was interested in writing a follow-up story to the one I had written for IowaWatch, mentioning the amount of ethnocentrism and bigotry she had seen recently in response to Syrian refugees. I was thrilled. I had already thought some about furthering my investigation into Iowa’s influx of refugees, particularly after Iowa Gov. Terry Branstad’s announcement on Nov. 17, 2015, in which he ordered all Syrian refugee resettlement efforts in Iowa to stop. When Jeanne contacted me, mentioning how former Iowa Gov. Robert Ray would be upset with the current governor’s decision, I felt intrigued by the connection her story held to what I had already published. The refugees’ faces are blurry on the fuzziness of the black and white screen, but the words of the broadcast say more than the picture. Phat Nguyen (who now goes by Patrick) is pictured briefly, while the reporter describes the plight of thousands of refugees coming to the United States, emphasizing how anxious and excited some of them are to meet their Iowan sponsors. “Many paid a life savings for passage on a boat, suffered through rough seas and bad weather, and floated for days just off shore while authorities decided whether they would be allowed to land. Once on shore, they were herded into refugee camps while awaiting word of their fate,” the report says. The rest of the Nguyen family is not shown, but the broadcast cuts to a brief picture of Jeanne’s parents, Wayne and Eleanor Buck, as they patiently wait to meet the family they have agreed to sponsor. “I am terribly excited, I’ve been waiting here all day,” says Eleanor in a short interview with a CBS reporter. 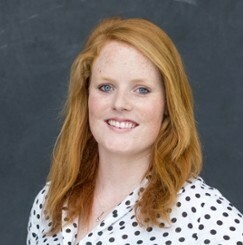 “I’m very excited—I was hopeful that at least one of them could speak a little more English than they can, but I guess we will just have to work at it.” Her excitement is only emphasized through the joyful smile and laughter that accompanies the statement, and it is clear she is fully invested in this life-changing decision. Although Jeanne acknowledged the initial tension of their age difference, she expressed her desire to communicate with the Nguyens and make school more comfortable for the boy. Every evening, Jeanne’s family went over to the farmhouse, where the Nguyen family had a large dining room table. They would sit around the table and talk with one another, attempting to communicate as best they could with the help of a very thick but tattered dictionary the Nguyens had brought with them from Vietnam. They were ethnic Chinese who had lived in Vietnam, so the dictionary was in English and Mandarin Chinese. “We would try to come up with something we couldn’t express and we would have to look it up in the dictionary,” Jeanne explained. She couldn’t remember any specific words they had learned, but the Nguyen family taught her younger sister how to count. It became a game of sorts, and was one of the main ways the two families grew to know each other. They talked about America, the Nguyens’ experiences in Vietnam, and any questions the family might have about their new life and new home. My initial interview with Jeanne went well, especially considering the racking cough and underwater sound of my sick-for-six-weeks voice. She seemed pleased to finally speak with me, her voice bubbly and enthusiastic as she asked me about my time at Cornell and with IowaWatch. She had seen my article in both The Des Moines Register and the Cedar Rapids Gazette and said she was interested in reading more of my investigations. “How did your parents initially tell you this sponsorship would be happening?” I asked, unsure how her family had decided to take on such a heavy responsibility. “So it was your idea?” I asked, my excitement growing as I listened to the crackle of her voice over the phone. Jeanne explained how her entire family got involved. Her aunt and uncle joined in their excitement, helping her parents figure out the details and provide support for the family. But there were also people within the community who were not supportive at all. Although Jeanne’s mother was upset, she remained persistent in figuring out the legwork for the family’s arrival. “My mother was a very unaffected woman—when she had a goal, she went for it.” Jeanne remembers her mother making a multitude of phone calls that year, asking for people’s help with different aspects of the sponsorship. Similar to current sponsorship for refugees in Iowa, resettlement in the 1970s relied mainly on support from churches and volunteer resettlement agencies. Roughly 6,000 to 7,000 refugees from Burma have settled in Iowa since 2009. According to the Iowa Department of Human Services, the Burmese became the largest group of refugees being resettled in Iowa by the Bureau of Refugee Services by the end of 2007. The influx of refugees is reminiscent of the 1970s. But differences exist. Refugees settled directly in Iowa when they arrive in the United States typically receive 90 days of core services from federal resettlement agencies, which provide assistance settling into housing, obtaining a Social Security card, and signing up for state aid. The U.S. Department of State’s Refugee Admissions Reception and Placement Program is responsible for placing refugees with an affiliated office and for providing these initial services, after which they are expected to be self-sufficient. Until 1991, federal programs gave refugees about 36 months to become self-sustaining with the use of financial assistance. Now, refugees are provided only eight months of financial assistance from the Office of Refugee Resettlement in addition to the 90 days of direct social assistance from the Reception and Placement Program. Within two months of the Nguyen family’s arrival in Melbourne, Iowa, one of them had a ruptured appendix. When Jeanne’s family went to the farmhouse to check on the man who was ill, the other family members were placing rocks on his back and pushing them into his skin. His face was down against the living room floor, a grimace inching across it as his family dug the pebbles into the curves of his back. Jeanne was confused by this, understanding it to be some cultural custom that the family believed would cure him, but she remembers her mother getting angry with them, saying he needed to be taken to the hospital immediately. But the rest of the family was afraid to send him to a hospital. “I think it had a lot to do with—if I remember right—their grandmother dying in the camp. I don’t know if she was taken to a hospital and died there, but they were afraid that if he went to a hospital he would die,” Jeanne explained. Fortunately, the family had been placed on some form of healthcare coverage upon their arrival to the United States, similar to what Medicaid programs provide today. Jeanne’s mother convinced them the care would be better, and the family finally agreed. “Had they been in the refugee camp in Malaysia, he would have died,” Jeanne said. The Pulau Bidong camp, where the Nguyen family lived for six months, was only 1 square kilometer in area and housed approximately 18,000 Vietnamese refugees by January 1979. After the Nguyens moved to Iowa that number continued to grow.